The DHT Temperature+Humidity sensor allows you to use your DHT11 (datasheet, adafruit), DHT22 (datasheet, adafruit), AM2302 (datasheet, adafruit), RHT03 (datasheet, sparkfun) and SI7021 (one wire Sonoff version) (datasheet, sparkfun) sensors with ESPHome. 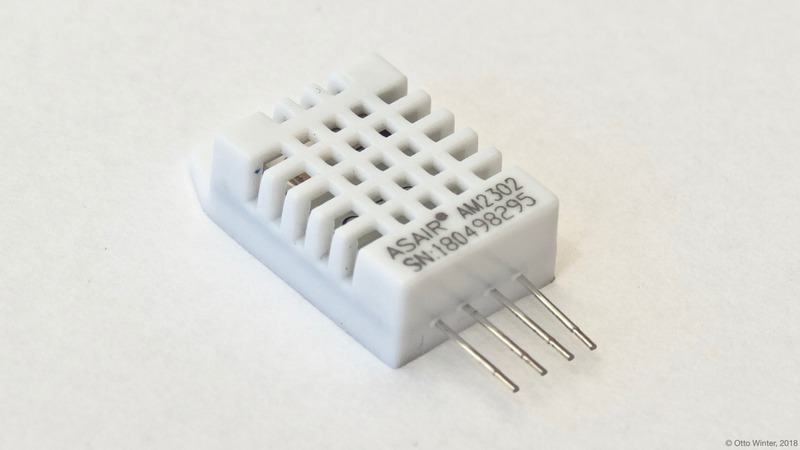 DHT22 Temperature & Humidity Sensor. The DHT22 and DHT11 require external pull up resistors on the data line. To do this, solder a resistor with about 4.7kΩ (anything in the range from 1kΩ to 10kΩ probably works fine, but if you’re having issues try the 4.7kΩ recommended by the manufacturer) between DATA and 3.3V. pin (Required, Pin): The pin where the DHT bus is connected. model (Optional, int): Manually specify the DHT model, can be one of AUTO_DETECT, DHT11, DHT22, AM2302, RHT03, SI7021 and helps with some connection issues. Defaults to AUTO_DETECT. Auto detection doesn’t work for the SI7021 chip. If you’re seeing lots of invalid temperature/humidity warnings in the logs, try manually setting the DHT model with the model: configuration variable. Other problems could be wrong pull-up resistor values on the DATA pin or too long cables.